Everyone wants an SUV these days, something Mercedes-Benz knows too well. 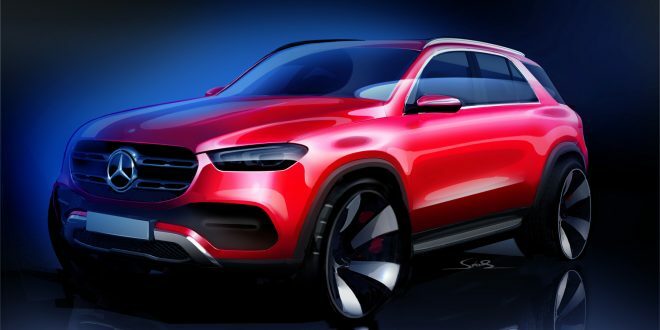 The brand is hoping to inject some new life into its SUV range next year with the next-generation GLE Class, previewed this week in a new sketch. The sketch gives a fairly clear look at the 2020 GLE, which appears to have a more muscular appearance than today’s version. The front clip appears to share some design traits with the recently-launched X Class pickup truck in certain global markets, while the overall body shape is not deviating too far from today’s familiar shape. Expect more dramatic design changes inside the new GLE as Mercedes upgrades it to the brand’s latest technology and design strategy. Mercedes has not offered up any official details about the 2020 GLE other than the teaser shots. Nonetheless, expect their latest inline four and six-cylinder engines to be in tow. A twin-turbocharged 4.0-liter V-8 will likely be reserved for the next GLE63 model, while some form of electrified variant is also expected to ultimately find its way to market. The current GLE has been untouched since its 2016 refresh, while a total redesign hasn’t happened since about 2012. The 2020 GLE will compete with the likes of the Audi Q7 and BMW X5 when it comes to market next year.